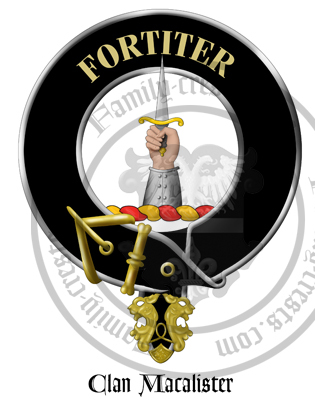 Clan Badge: A dexter arm in armour erect, the hand holding a dagger in pale all proper. Clan MacAlister is a branch of Clan Donald, and traces its descent from Alasdair Mor, son of Domhnall mac Raghnaill who was grandson of Somerled. Somerled is claimed as the ancestor of the MacAlisters, MacDonalds and MacDougalls. Gaelic tradition gave Somerled a Celtic descent in the male line, though a recent DNA study has shown that Somerled may have been of Norse descent. By testing the Y-DNA of males bearing the surnames MacDonald, MacDougall, MacAlister, and their variants it was found that roughly a quarter of MacDonalds, a third of MacDougalls, and forty percent of MacAlisters tested shared the same Y-DNA and a direct paternal ancestor. This distinct Y-chromosome found in Scotland has been regarded as showing Norse descent in the British Isles. Birth of a clan: After the fall of the Lordship of the Isles in 1493, the MacAlisters seem to have formed into an independent clan of their own, and their chief, Ian Dubh (Anglicisation: Black John), lived at Ardpatrick (Ard Phadriue) in South Knapdale. Later chiefs have styled themselves as Mac Iain Duibh, (sons of Black John) in reference to him. The clan's lands were never very extensive, were located mostly in Kintyre. As early as 1481 a Charles Macallestar was made Steward of Kintyre. 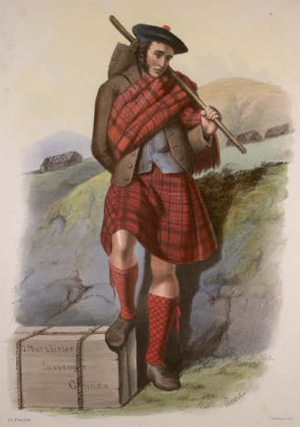 Later many MacAlisters were found in Bute and Arran. The principal family of the clan were the MacAlisters of Loup, and up to twenty years after the first record of Ian Dubh, Angus Macallaster of the Loupe who is called "John Dubh's son" is mentioned. After the forfeiture of the Lordship of the Isles, the MacAlisters of Loup attached themselves for about one hundred years to the more powerful Clan Ian Vor. The "Laird of Lowip", the chief of the clan, appears in the General Band of 1587, in which Highland chiefs were held accountable by the Government for their tenants. In 1618 the Laird of Loup was one of the twenty barons who were made responsible for the good rule of Argyll during the absence of the Earl of Argyll. Alexander MacAlister of Loup fought at the Battle of Killiecrankie, supporting the cause of the deposed James VII of Scotland, and also at the Battle of the Boyne. Alexander was succeeded by his son, Hector, though he died without issue and was in turn succeeded by Alexander's brother, Charles. Charles married the daughter of Lamont of that Ilk. Charles, 12th of Loup, married Janet Somerville, heiress of Kennox, in 1792. In 1805 Charles assumed the name and Arms of Somerville along with his own, and from then on this family has been known as Somerville McAlester of Loup and Kennox. In 1846 Charles MacAlester of Loup and Kennox, was granted the right to take up Arms as Chief of the clan, by Lyon Court. Lieutenant-Colonel Charles Godfrey Somerville MacAlester of the Loup and Kennox, succeeded him as Chief of Clan MacAlister is 1903. His seat was Kennox in Ayrshire, though the seat of the clan as since been sold, and the current chief, William St John Somerville McAlester of Loup and Kennox, lives in England. Current Clan Chief: The current chief of the clan is William St John Somerville McAlester of Loup and Kennox, Chief of the Name and Arms of MacAlister. The chief was recognised by Lord Lyon in 1991 as being the rightful chief of the clan. 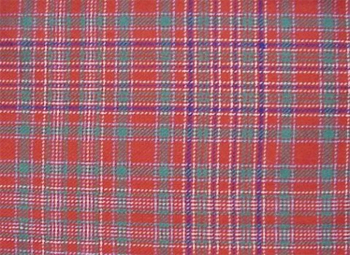 The chiefs of Clan MacAlister are styled Mac Iain Duibh, in reference to Ian Dubh, whom the line of the Lairds of Loup claim descent from. Arms: Or, an eagle displayed gules, armed sable, surmounted on the breast of a galley of the first within a bordure of the third charged with three cross crosslets fitchee argent. Crest: A dexter arm in armour erect, the hand holding a dagger in pale all proper. Supporters: (Clan Chief only) On a compartment entwined with an escrol bearing the second Motto) Dexter, a bear pierced in the back with an arrow all proper; sinister, an eagle proper. The principal cadet of the MacAlisters of Loup were the MacAlisters of Tarbet, who were Constables of Tarbet Castle on Loch Fyne. The MacAlisters of Tarbet, supported William of Orange and the Government during the Jacobite Uprisings, though they were bankrupt after Culloden. Another cadet branch were the MacAlisters of Glenbarr, in Argyll. The MacAlisters of Glenbarr descend from Colonel Matthew MacAlister, who in 1796 purchased Rosshill and over the next twenty years acquired the lands of Barr and other pieces of land. By 1822 the lands of Glenbarr were over 17,000 acres (69 km²). Glenbarr is the location of the Clan Macalister Centre.